All content © Rosalie Ungar, 2016. All rights reserved. Halfway through her thirty-five-year bout with Atrial Fibrillation, Rosalie Ungar, at sixty-two, has a heart attack while giving a presentation on heart-healthy foods. So starts the battle to take control of her Atrial Fib and newer heart issues. 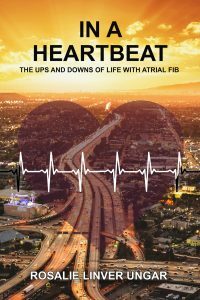 Told from the perspective of the patient, In A Heartbeat traverses the ups and downs of living and thriving with an irregular heart rhythm. Determined to question, challenge and negotiate doctors’ orders, Rosalie navigates changes in technology, pharmacology and physicians’ recommendations with a sharp wit and a tenacity for self-education–empowering herself and her readers along the way. Now available from all major retailers in print, digital, and audio formats! Click the logo of your favorite retailer to visit their website.